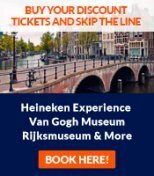 We're working our asses off (and having fun doing it) here at Amsterdam-Advisor.com to bring you high quality, original and concise Amsterdam travel information - all free of charge. Can we ask something in return? If this site has been helpful to you, please help others find it. Make a link to this site from your blog, Facebook or Myspace page, your web site, the forums you visit, or anywhere else you think it's interesting for people. Thanks - every link helps! Add This Site to Your Facebook, etc. Go to your favorite page and click there on the tool to share that page on your Facebook page, Twitter, etcetera. If you want to stay updated with news from Amsterdam-Advisor.com, then please subscribe to our RSS feed. It sounds techie but it in fact it's an easy way to get headlines from this site in your browser - without you having to give out your email address. Thanks a lot - and we hope that you enjoy reading this site as much as we did making it!